Baby girl’s nursery has changed, and had a few little improvements since I last posted about it. So, I thought it might be fun to share some new photos with you! I didn’t want a nursery for her that would be full of brightly color characters. I wanted something more authentic, I guess you could say. 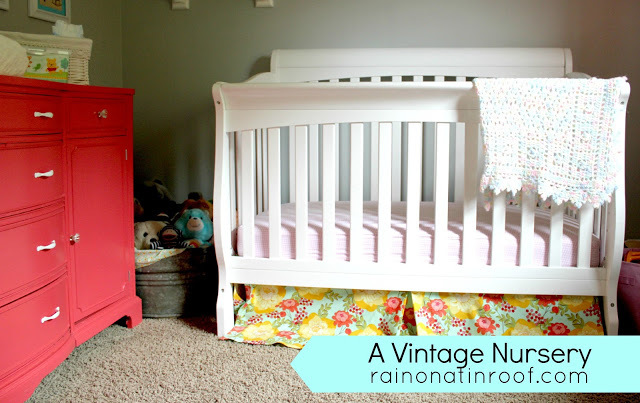 So, I created a vintage nursery for her. The dresser was a $75 Craigslist find. I sanded and painted it Salmon Pink by Behr. The mirror was another Craigslist find, $30, that was previously gold. I picked up a couple of vintage nursery rhyme books at an antique store and framed my favorites in simple white frames from Michael’s. 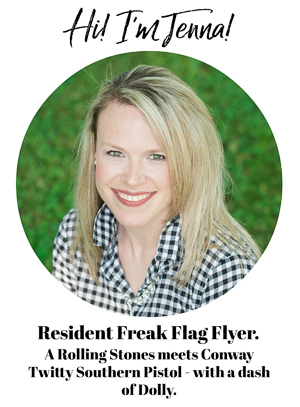 Read more about those here. I wanted the wall color to be something she could grow with. I took a paint swatch of some gray paint I loved to Home Depot and had them custom color match it with Behr paint. The coat rack is really just a piece of old barn wood from the family farm with a piece of molding on top and hardware from Lowe’s. I found the hamper at the Salvation Army for a whopping $2. It did not look anywhere near this cute when I got a hold of it. It had been painted yellow, which was peeling, and had this horrendous floral pattern underneath that. I sanded it and sprayed it blue. The top wouldn’t take paint well, so I used fabric to cover it. Grunt Labor was way “wowed” by this. He thought it was the cutest thing ever. Score. I picked up an old chandelier at Habitat for Humanity ReStore and spray painted it the same color as the hamper and coat rack. The chair was another Craigslist find. I made something close to a slipcover for it (there’s a reason there is no close-up photo of the chair). I called about having a professional make one, but that was going to be in the ballpark of $300. Um, no, I will not pay $300 for a slipcover for a chair I paid $25 for and will probably get rid of in a few years….So, it got a makeshift slipcover and so far, so good. The bedding was purchased from Etsy. As soon as I saw it, I knew it was what I wanted for the room. 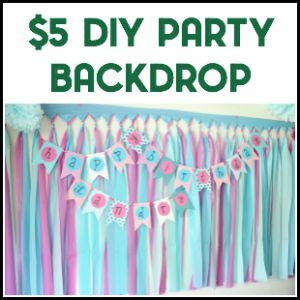 I made the tissue paper pom-poms that hang in the corner. The artwork above the bookshelf was actually from the end of my crib when I was a bambino. The bookshelf used to sit in my grandparent’s den. I remember my crayons being stored in a cigar box on the bottom shelf for me to easily access them. Landry’s cigar box is already there, just waiting on crayons. She would totally eat them now. Go ahead and judge the cigar box crayon storage. I don’t really care what you think about it. Its not like there are cigars in the box. Wait – I better go check….. The Bambi wall art was in Grunt Labor’s nursery when he was little. I was over the moon when my mama-in-law broke out those bad boys! What do you think? 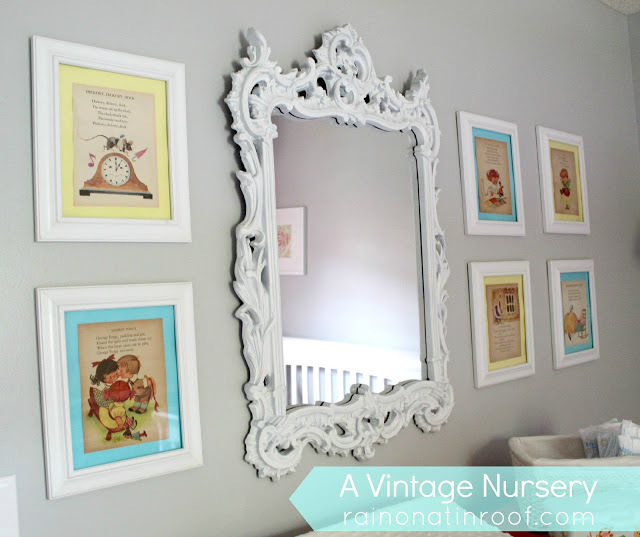 The perfect amount of vintage nursery without it looking old? 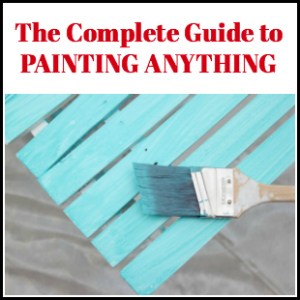 Need more nursery ideas? Here are nine ones that won’t break the bank! How adorable! I love all the bright colors and fun art on the walls! precious room! 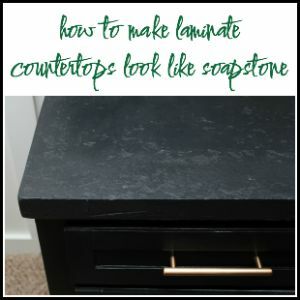 I am obsessed with the salmon dresser! aw… girlie stuff really makes me melt! It is so cute! Yes, vintagey perfection 🙂 I LOVE your makeovers on the old furniture. Especially the dresser and mirror, so awesome! Such a sweet little room for your sweet girl! 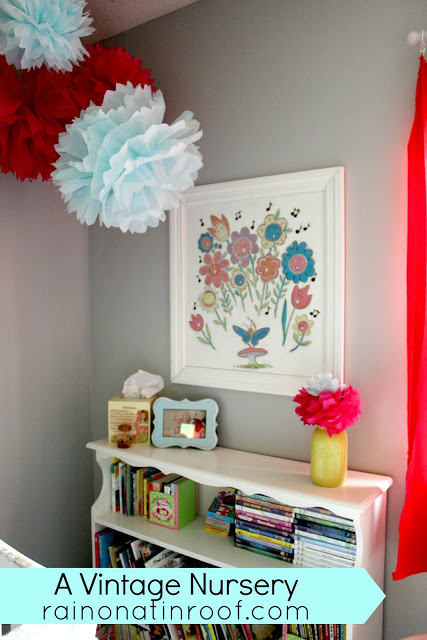 I love little girl rooms…so fun to decorate!! Awww I love it! I love how you used so many of your own nursery things from when you were little. I had my old mobile on little man’s crib and it made it so special. I also have an intense love of cigar boxes. Now I know where to put our crayons! Love it! My oldest’s nursery had a vintage nursery rhyme theme, so it makes me all nostalgic to look at yours :). That dresser is fabulous! Ahh this is so beautiful, are you an interior decorator? I so want to be thrifty and diy-ish when we move into our new home…but I’m afraid I don’t have the skills. Good thing I have your blog to keep me inspired! This is so sweet. It’s a great mix of vintage charm without feeling like you stepped back in time. Found you via My Repurposed Life! Such a lucky little girl with a very talented Mommy. You did a wonderful very special job on her room. I love the colors of all of it. Everything looks so warm and welcoming, serene for a little one. I’ve read that bright happy colors are very good for a baby. This is just adorable. I love the colors and that light fixture is totally awesome! What a sweet nursery! Adorable! I love it! Those Bambi cut-outs are too cute. How sweet that your mother-in-law saved them! 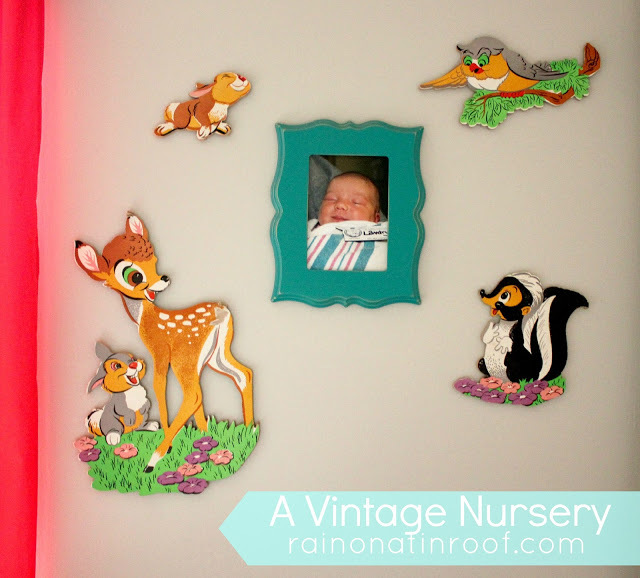 The nursery is adorable! I love the colors you used. 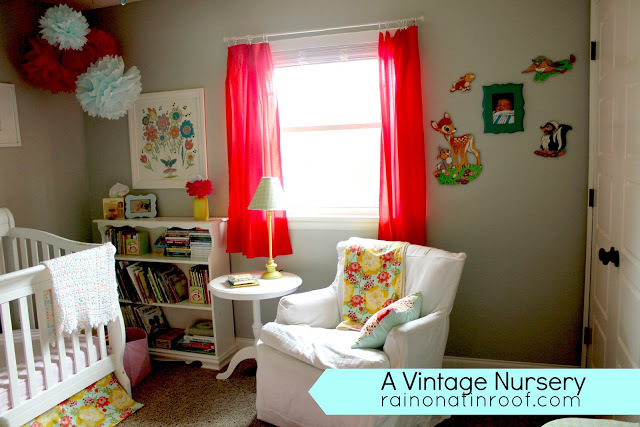 The nursery looks amazing, I love the bright and cheerful colors. 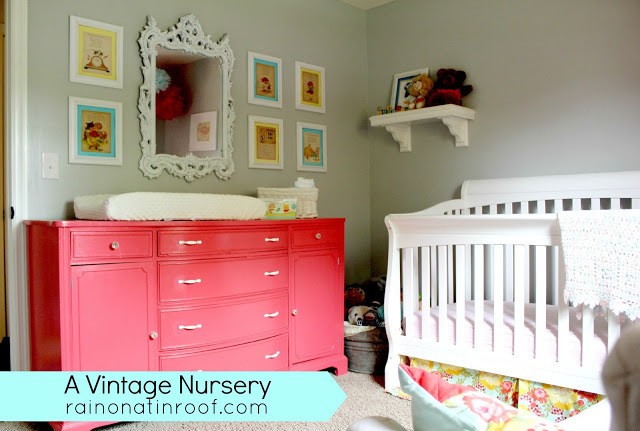 This is such a sweet nursery! 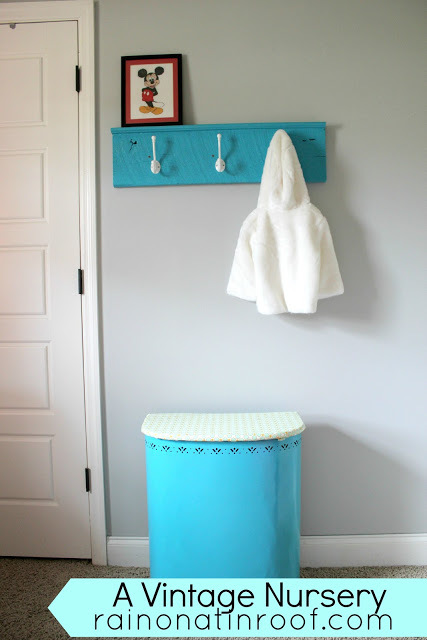 I’m really loving grey paint right now and this will be perfect because as she grows the paint color will still work! Great job, Jenna! What a vibrant nursery! The pattern of fabric reminds me of Lilly Pulitzer too. So cute! Wanna hear something funny?! My crayons were always stored in a cigar box growing up, and my grandma kept the crayons at her house in a cigar box, too! They are handy little things! Absolutely adorable, I love the artwork that was from your crib and from your hubbies nursery how unique is that! The colors you used are fantastic, love the whole room you did an incredible job! such a fabulous and happy room! and guess what- just bought the same bambi plaques at a yard sale and not sure what i will do with them but i couldn’t leave them!!!!! You did such a great job. I love the salmon dresser and the refinished mirror. I’m a new follower! Love it! thanks for sharing at bacon time. You are so very talented Jenna!! It is truly a gift to be able to come up with such neat ideas! Thanks for sharing them at One Sharendipity Place! I LOVE all these projects you’ve done. Gorgeous nursery!! just adorable and perfectly balanced. 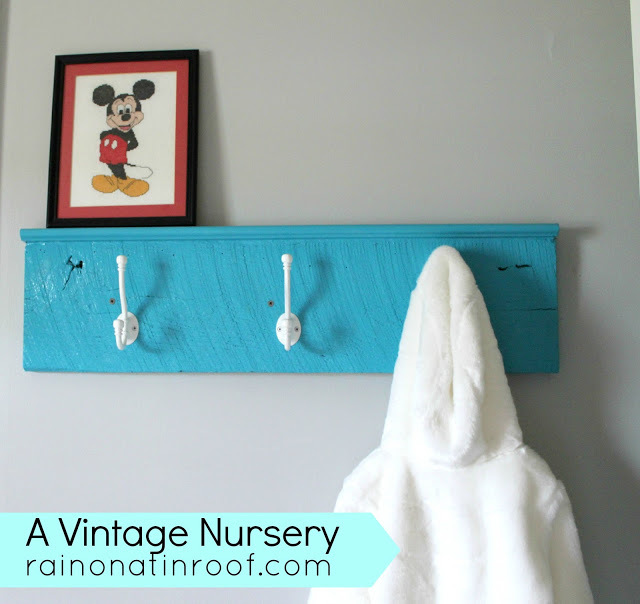 I just finished doing up our nursery and while it’s totally different – I just love the vintage you used! What a perfect nursery!! I love all the sentimental touches from your childhood and great finds that bring it all together! So cute!! I absolutely LOVE that you included things from your nursery. What a great idea! I love the color you chose for the dresser too. Looks great! Everything about this is just ADORABLE!! I can’t even pick a favorite part because there are so many. 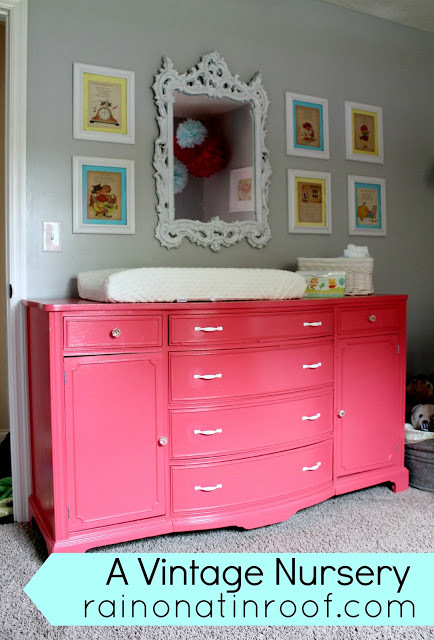 I love the giant pompoms, the dresser and the crib skirt…plus everything else! Nice job! Lots of interesting features in this room. The salmon dresser and curtains really “pop.” It looks comfortable and cozy. Thank you so much, Anna! 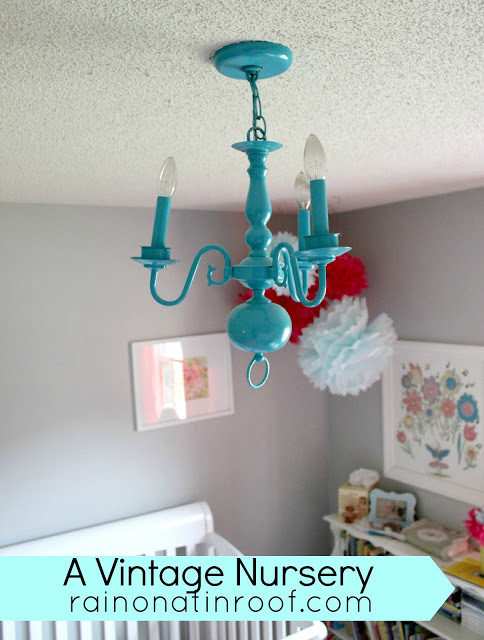 I love all the colors in this room – its perfect for a nursery! I am so happy you found me! 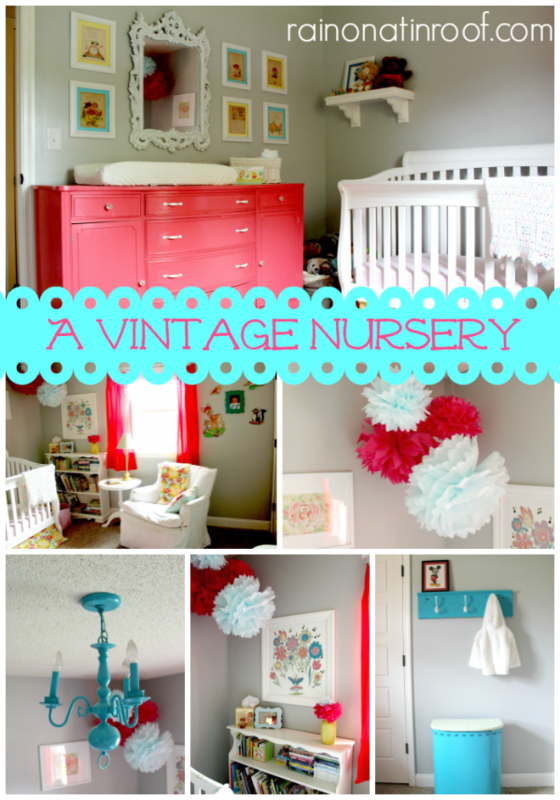 What a sweet nursery! I popped over here after going through your beautiful home tour. I absolutely LOVE this room. My favorite part is the little vintage Bambi wall hangings. I see these every now and then at thrift stores and always thought they would be sweet in an up-to-date, modern baby’s room! Oh, thank you, Tania! I just love those vintage Bambi wall hangings! I am soooo glad that my mother-in-law hung onto them! Your room is so cute! I was wondering if you could tell me what gray color you used? I am getting ready to build a house and love that gray. Thanks, Alicia! That gray is Stonington Gray by Benjamin Moore. It is also what is in my bathroom. However, I went to Home Depot and had them mix the color in their Behr paint. Was that dresser a dresser or was it a buffet that you turned into a dresser? I’ve seen these before and they were buffets. Just inquisitive. Hey Denise! Yep, its technically a buffet, we just use it as a dresser! Was this a buffet before you made it into a dresser? I have seen many like this and they were buffets. Just inquisitive. Yep, it was a buffet!